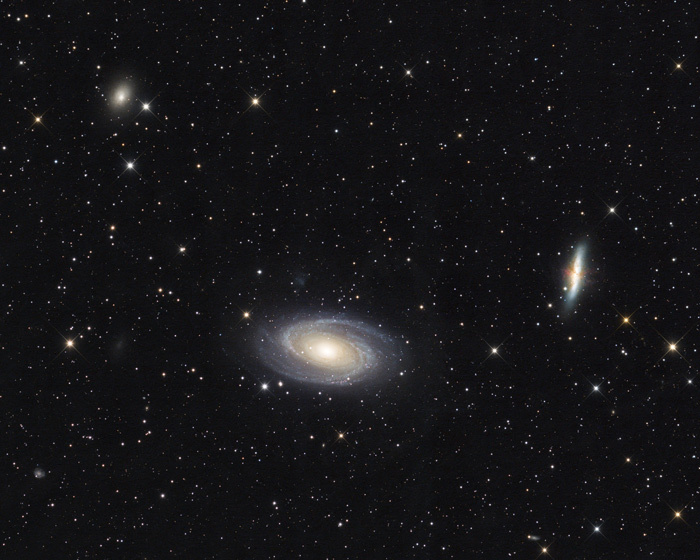 M81 Galaxy Group image is copyright by Patrick Winkler. M81 Group includes dozens of gravitationly bound galaxies. The three prominent ones shown here are: M81 (Bode’s Galaxy) at center, M82 (Cigar Galaxy) at right, and NGC 3077 in upper left. Tele Vue-NP127fli astrograph equipped with FLI MicroLine ML 16200 monochrome camera, FLI CFW 2-7 filter wheel, and FLI Atlas focuser was mounted on an Astro Systeme Austria Direct Drive ASA DDM60 Pro mount. Exposure was as follows through HαLRGB filters (minutes): 150 259 91 91 91. What is a Tele Vue-NP127fli? The NP127fli is a 127mm / 5-inch, f/5.3, APO (Nagler-Petzval) astrograph with an optical arrangement of 5-elements in 3-groups. 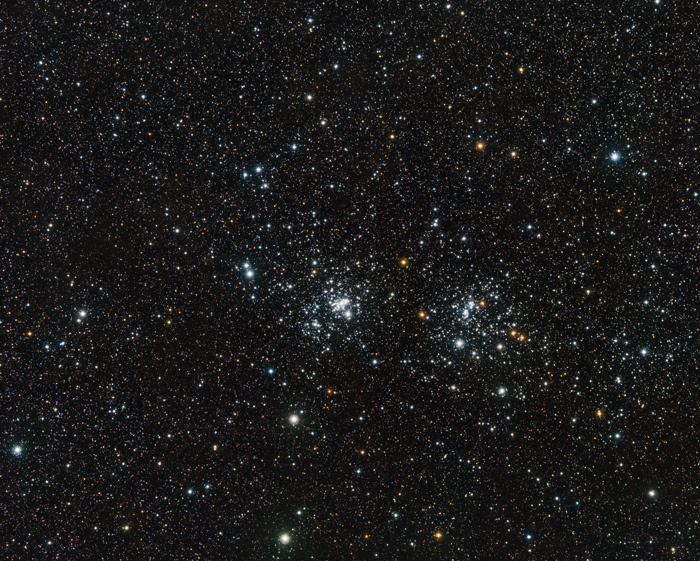 Its sole purpose is to create wide-field images — 4.3-degrees on the diagonal of the 52mm diameter image circle. From the image below you’ll note that this scope lacks a traditional focuser. This astrograph is designed to operate with the Finger Lakes Instrumentation (FLI) Atlas electronic focuser – hence the “fli” designation. The NP127fli is specifically designed so when the Atlas is at the center of its focus travel, the combined path-length of FLI focuser, filter-wheel and camera puts the CCD sensor at the focal plane of the telescope’s optics. In order to achieve this, the NP127fli’s “Large Field Corrector” lens (visible in the photo) physically sits inside the Atlas. The benefits of the Atlas over a typical manual rack & pinion focuser are: 85 nm/step size, ability to handle 25-lbs of equipment, and FLI’s Zero Tilt Adapter system. We contacted Patrick and asked him how got into astrophotography. I had my first contact with astronomy at the age of 14. At that time I visited the public observatory in Traiskirchen (25km south of Vienna) and was fascinated by the telescopes at first sight. My interest in astrophotography became apparent after a short time. At that time I made my first experiences with taking pictures of the night sky with a Super Polaris DX mount and telephoto lenses. A few years later the digital revolution “took place” and new and unimagined possibilities opened up in astrophotography. In 2005, a friend and I built our own observatory, which we equipped for remote imaging. 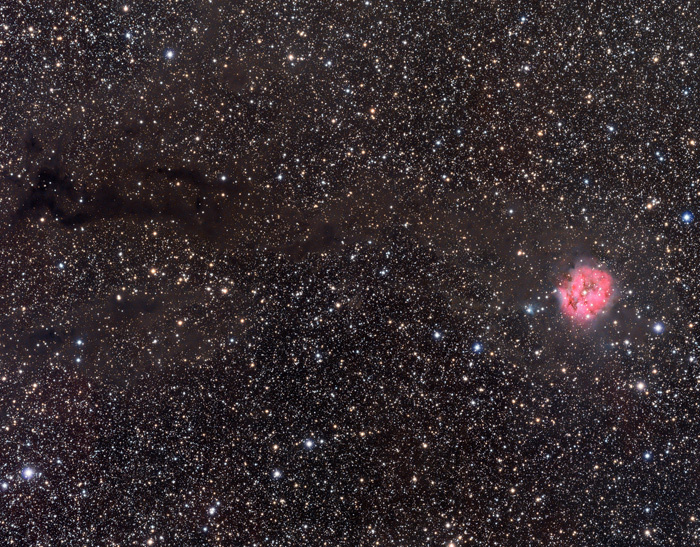 Cocoon Nebula image is copyright by Patrick Winkler. Tele Vue-NP127fli astrograph equipped with FLI MicroLine ML 16200 monochrome camera, FLI CFW 2-7 filter wheel, and FLI Atlas focuser was mounted on an Astro Systeme Austria Direct Drive ASA DDM60 Pro mount. Exposure was as follows through LRGB filters (minutes): 100 80 80 80. We asked him why he choose and uses the Tele Vue-NP127fli for astro-imaging. I used an 8“ Newton for a few years. It was a very good telescope, but frequent collimating was annoying. So after a lot of research, my choice fell on the TeleVue-NP127fli. The telescope was usable out of the box. No collimation necessary and wonderfully corrected. 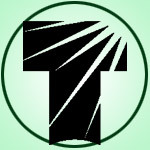 Due to the compact design and the direct attachment of the image train, the telescope is very stiff. 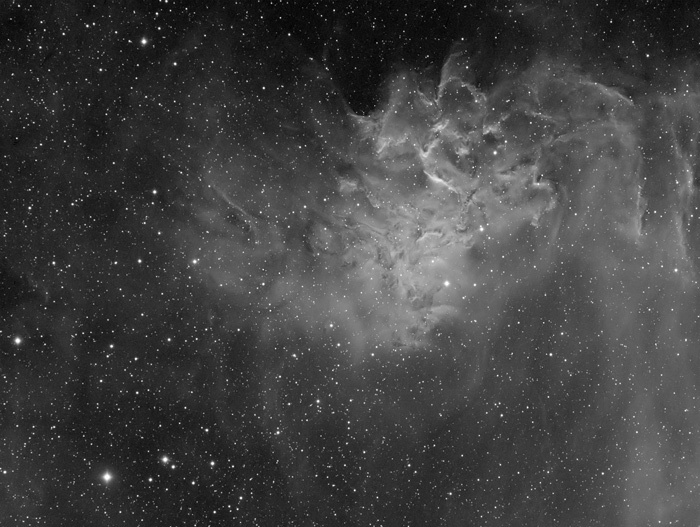 The short focal length is also ideal for my favorite objects – dark nebulae. Flaming Star Nebula image is copyright by Patrick Winkler. Tele Vue-NP127fli astrograph equipped with FLI MicroLine 8300 monochrome camera, FLI CFW 2-7 filter wheel, and FLI Atlas focuser was mounted on an Astro Systeme Austria Direct Drive ASA DDM60 Pro mount. Exposure was as follows through Hα filter (minutes): 90. He also told us about his observatory. Observatory with Tele Vue-NP127fli mounted on Astro Systeme Austria Direct Drive ASA DDM60 Pro mount images are copyright by Patrick Winkler. When not not exploring the night sky, Patrick works as an occupational psychologist at the Austrian workers compensation board. He also volunteers at the very same public observatory in Traiskirchen that inspired his love of the night sky. 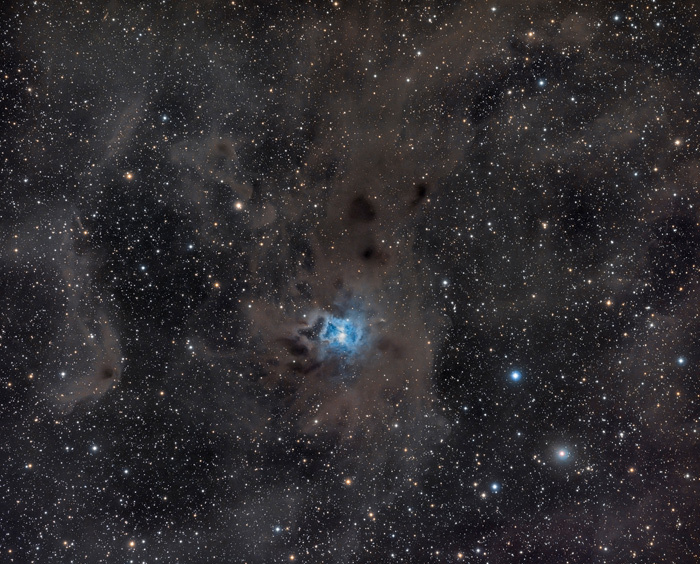 Iris Nebula image is copyright by Patrick Winkler. This image was European Astronomy Picture of the Day (EAPOD) for 17 December 2016. Tele Vue-NP127fli astrograph equipped with FLI MicroLine ML 16200 monochrome camera, FLI CFW 2-7 filter wheel, and FLI Atlas focuser was mounted on an Astro Systeme Austria Direct Drive ASA DDM60 Pro mount. Exposure was as follows through LRGB filters (minutes): 180 60 60 60. Next Next post: Mars Madness 2018 Eyepiece Rebate for U.S. Customers!